Once again a marine species has ended up in the wrong part of the world. landed on Dawud's foot, sending him on a trip to the emergency room. 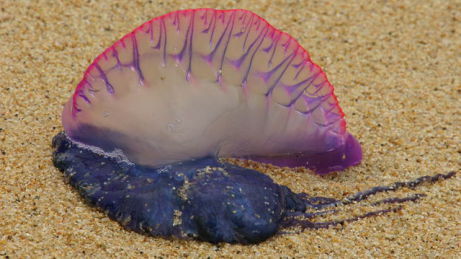 The Portuguese Man of War usually lives in warmer waters in the Indian and Pacific Oceans, but is occasionally known to make it into colder climes along the Atlantic Gulf Stream. It is not a jellyfish, despite its similarities in structure and appearance. It is not even a single creature, but a collection of creatures that operate together as one to survive. None of these creatures is capable of surviving outside of the group organism. The creature itself floats on the surface of the ocean by means of a gas-filled bladder. The tentacles, which possess a toxic sting, can grow up to 150 feet in length. The stings are actually caused by tiny barbs that can break off in the skin. They can be deadly by causing anaphylactic shock in some people. Dawud was lucky to have survived this encounter with the creature. The doctors gave him a part of the stinger in a jar to keep as a souvenir of the experience. Dawud was also fortunate that his mother, Yasmin, had caught the Man of War in a jar and brought it along. It helped make sure that he got the appropriate treatment right away. Many people report their injury as a jellyfish sting, which leads to improper treatment. Yasmin commented that Dawud is really into wildlife and animals. While the experience has not dampened his enthusiasm, it may have taught him to be a bit more cautious in his investigation of the unknown.